"This sounds wonderful when played fingerstyle, and it shines when put up against the volume of a banjo or mandolin." There are very few companies that make wood-body resonators ukuleles--the design and construction challenges are significant. The resonator cone is extremely delicate. The strings pass over the bridge/saddle which is attached to the cone. The tension of the strings, in combination with the angle to the tieblock, determine how much downward pressure is placed on the cone. It is the precise control of this downward pressure that determines the acoustics of the resonator. Too little pressure and the sound is distorted--less pressure still and the cone buzzes. Too much pressure and the voice becomes choked--more pressure still and the cone will be damaged. After much testing and evaluation, we determined the perfect amount of pressure to place on the cone, and we carefully control that during the construction of each instrument. We custom-turn a wooden soundwell to support the resonator cone. This provides level support for the cone while allowing it to freely resonate. After careful testing, we chose a National cone for it's clear tone, long sustain, and lively voice. 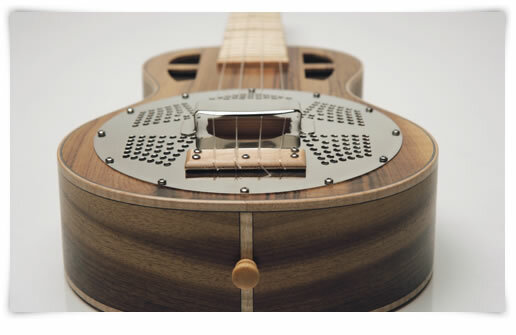 The result is a resonator ukulele that still retains the acoustics of a wood-bodied instrument. Our goal is to bring out the voice of the wood, while providing passive amplification. This instrument sounds wonderful when played solo fingerstyle, and it shines when put up against the volume of a banjo or mandolin in a music circle. For a more woody tone, choose woods such as koa, mahogany, sycamore or mango. For a more punchy tone with more of the resonator cone component, choose the brighter woods with spruce tops. The hand-shaped neck, radiused fretboard, meticulously leveled frets, and individually dressed fret ends deliver the playability that every serious musician should demand.